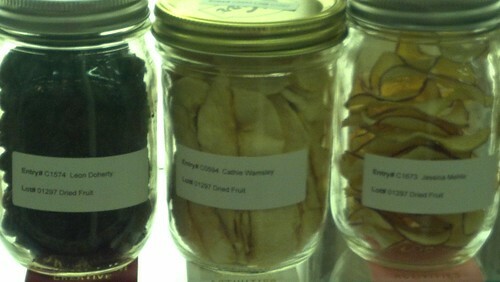 Unwinding at the fair: me, my camera, and dried fruit. I’ve been musing on a different way to organize my week. Could it work? And by “work” I mean if I did this, would I become more sane, and less stressed out by my obligations? Monday: Physical fitness day. Do all my running, cooking, healthy eating, stretching, strength workouts, and avoid alcohol and the TV two hours before bed. Always get a massage. Do not sit at a desk or stare into a lit screen. Tuesday: Creativity day. Make stuff, tend to the garden, dress flamboyantly, mix crazy cocktails. Be stylish. Shop. Stay up late, listening to live music. Do the creative component of my full-time design job. Get pastel chalk in my fingernails. Wednesday: Finances rock star day. Tend to my accounts, investments, avoid using credit, shop only at Rainbow foods, use only dry beans. Make do with rare haircuts & coloring. No massages. No clothing shopping. Consider the financial components of my full-time design work. 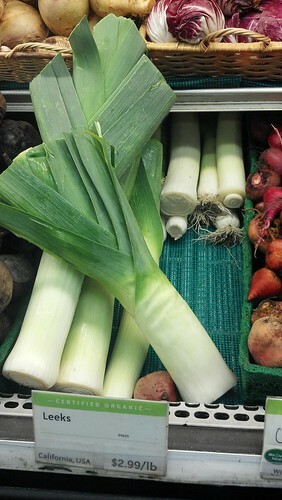 Leek fascination: relaxing while shopping. Thursday: Mrs. Fix-it day. Fix and maintain everything. Sew my own curtains, gifts, wedding gifts. House is spotless. Clean my bike. Re-caulk the tub. Do the user experience part of my full-time job. Friday: Business day. Market my wares, which currently are my yoga classes. Build new playlists, draw up fliers, mailings, goodies for students. Saturday: Community building day. Spend time with my neighbors or other people with whom I share a community, i.e. climbers, runners, etc. Sunday: Mental health day. Practice yoga, read on the patio, watch a fun movie with husband. Listen to music & educational podcasts. Wander around the city and take pictures. Climb outdoors with friends. Do the grocery shopping. Eat just a little bit of junk food, or at least some buttered popcorn. Look for (or just notice) patterns in the real world that could apply to my design work.